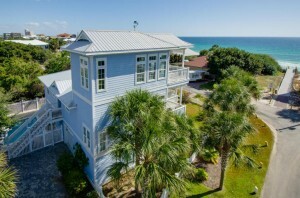 Gulf view beach home in Seagrove Beach, FL. Located just east of Seaside this 30A gulf view home features 6 bedrooms, 5 bathrooms, heated pool, third floor tower, heart pine floors, custom shell fireplace, custom cabinetry, media/game room, spectacular gulf views, and 3,530 sq. ft. of heated and cooled space. Centrally located in the heart of Seagrove Beach and steps from the gulf this home would make a great vacation rental, permanent residence or second home. Contact one of our expert agents today to set up a private showing of this gulf view home in Seagrove Beach.